Our premium Fibreglass Roofing Kits (1 - 100sqm) are supplied with 1 layer of 450g or 600g Matting, Fire Retardant Topcoat (Dark Grey) and Flexible Roofing Resin. Please select the size required followed by any tool requirements. Tools are automatically included from 1-25 sqm. All size options above are available with or without tools. Fibreglass Pond Kits are supplied complete with all the materials and tools needed to cover the area required with 2 layers of 450gm mat, 1 layer of 30gm glass tissue and 1 layer of topcoat. The Universal Fibreglass Kits are supplied complete with all the material needed to cover the area required with 1 layer of 450gm Fibreglass Mat and 1 layer of Topcoat. Sufficient Catalyst is included for both the resin and topcoat. The FibreGlassDirect basic repair kits contain Lloyd's Approved General Purpose Resin, Tools and Fibreglass Matting. It is a great, multi-purpose repair kit which can be used for repairing anything from boats to downpipes! Basic kits are available in 1, 2.5 and 5 square metre sizes. Please note Topcoat is not included with our Basic Fibreglass Repair Kit range. These fibreglass resin and glass kits are the perfect basics for any fibreglass/grp repair. Included in this kit is our best selling Lloyds Approved Polyester Resin which can be used for automotive, marine or general DIY repairs and our standard 450g Chopped Strand Mat. Standard GRP Fibreglass Roofing Kit with materials to cover one layer with 450g matting and non-fire retardant Roofing Topcoat in a choice of Dark or Light Grey. This Fibreglass Kit is used for applying Fibreglass to a plywood lining of a van. Once the fibreglass has cured it will be tack-free, easy to clean and maintain. This will ensure the inside of your van stays protected for longer! Choose your preferred topcoat colour and the rough size of your van, small or medium. Our great value TruPro Surfboard Repair Kit is suitable for small Surfboard repairs. The Kit comes complete with our highly transparent Xtreme Special Surfboard resin which cures quickly and is also UV stable. You will also receive Woven Roving and tools to help you complete a professional repair. The FibreGlassDirect team are the experts when it comes to fibreglass kits. Our kits are built on the needs of our customers and their projects. We stock basic kits, GRP roofing kits, pond lining kits, van lining kits, boat repair kits and universal kits for everything in between. Our Flat Roofing Kits cover up to a whopping 100 square metres with Pond Kits covering up to 60 square metres. Our kits are designed to make fibreglass builds and repairs affordable and easy. 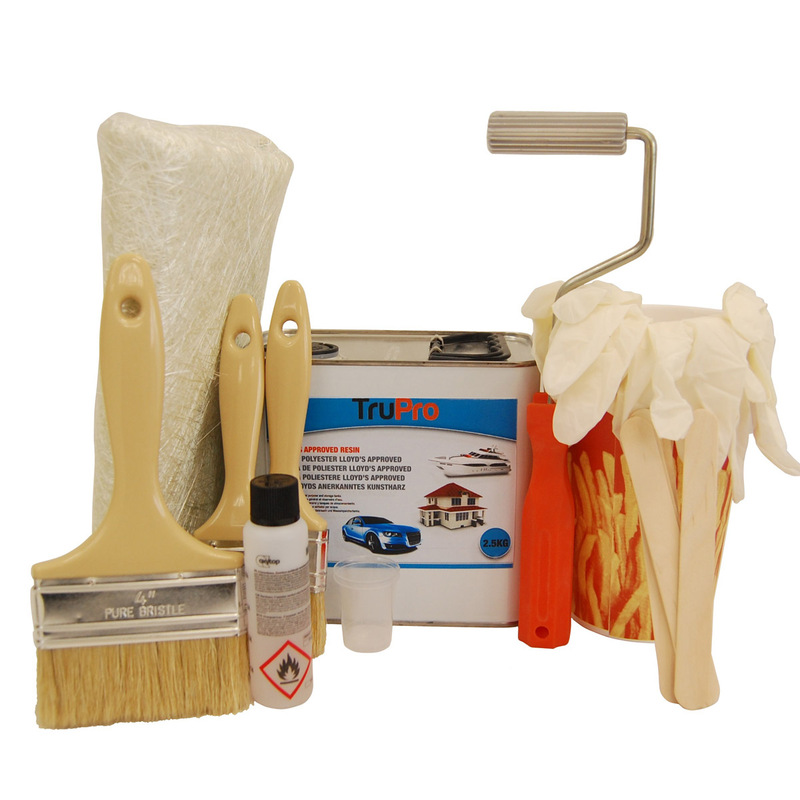 These kits give you everything you need including Resin, Matting, Topcoat and Tools to complete a professional fibreglass repair or build, even for DIY enthusiasts. If you need advice, why not check out our 'How-to' section for guidelines.